imPRESSions Worldwide is the Contiweb Fluid Applicator agent for customers in North America. Call Dave Gilmore for more information at 619-548-1409! imPRESSions Worldwide, located in Skagit Valley Washington, is the headquarters for all your flexible packaging needs including the Thallo Packaging Press! Ever since 2004 Contiweb has introduced a remoistening and silicone applicator system successfully in the market. Based on the experience with over 200 systems worldwide, Contiweb developed a new approach how to use silicone better and more efficient without losing any performance on the remoistening function: the Contiweb Fluid Applicator (CFA). The new CFA now introduces the ability to mix pure silicone oil with water on-the-fly within one system. By delivering a fresh mix which is used immediately, only a single agent is required as surfactant, which helps to control the delicate balance required for maintaining uniformity and consistency of the film of silicone and water on the web. 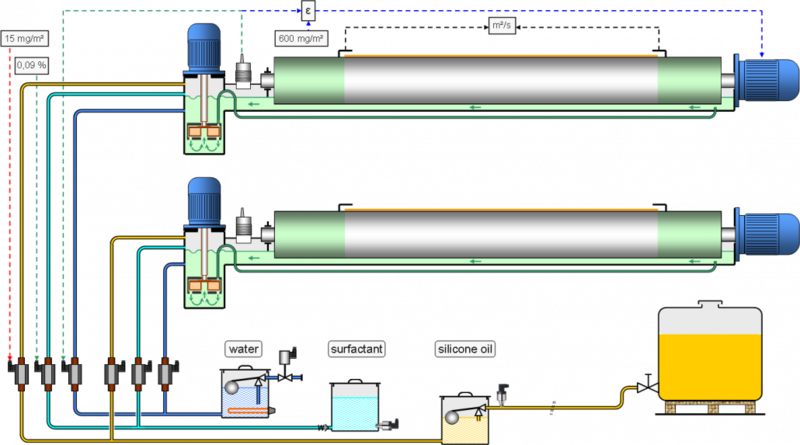 This system controls individually the oil and water content for each individual side of the paper. The function of remoistening is fully guaranteed and requires no special precautions. Whereas conventional systems use a silicone mixture, the CFA uses pure silicone oil which guarantees a considerable reduction in silicone oil consumption. In addition to the performance and silicone consumption benefits, the new system offers a substantial financial gain as it reduces your raw material costs. With the current cost of silicone your savings are more than 50 percent. Like many of our new dryer’s developments the CFA is offered as upgrade to existing Ecocool and Ecoset dryers. Moreover, the system is available as standalone unit, offering the same benefits, to replace the existing standalone silicone system in any press line. The principle of the new system is based on the use of 100% silicone oil, mixed with the amount of remoistening water directly in the applicator trays, immediately before it is applied to the printed web. A large reduction in silicone consumption can be reached by applying the fresh mixture of pure silicone oil, surfactant and water to the web in a perfectly-controlled way. Contiweb Fluid Applicator (CFA) offers more control and immediate cost savings. Additional longer-term savings through reduced equipment wear and maintenance. Optional and retrofittable on Ecocool and Ecoset models.